SAN DIEGO — The first scheduled hearings under a new Trump administration policy to make asylum seekers wait in Mexico while their cases wind through U.S. immigration courts will be held Tuesday in San Diego. The shift comes as more asylum-seeking families from Guatemala, Honduras and El Salvador arrive at the U.S. border as they flee pervasive gang violence and poverty. The shift followed months of high-level talks with Mexico about asylum-seeking families who have been released into the U.S. while their cases took years to get through immigration court. The administration hopes that forcing people to wait in Mexico will discourage weak claims and help reduce a court backlog of more than 800,000 cases. Critics say the policy forces Central American asylum seekers to wait in dangerous environments such as Tijuana, which had more than 2,500 homicides last year, and invites other problems, including difficulty finding legal advice in Mexico. Mexico has described the U.S. shift as a unilateral move by the Trump administration — a characterization that U.S. officials readily acknowledge. 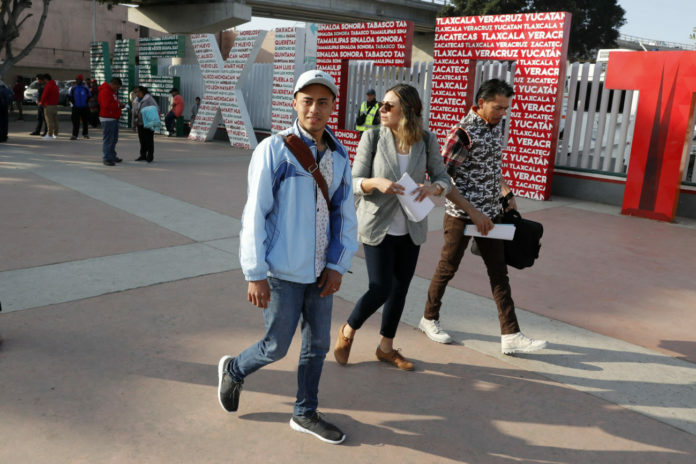 However, officials in Mexico say humanitarian reasons led them to temporarily allow the asylum seekers to wait in that country. One asylum-seeker from Honduras reporting for his first hearing Tuesday said his wait has been problem-free. The man would only identify himself by his first name, Ariel. His home country is wracked by gang-fueled violence, and many asylum-seekers worry about retribution against their families still there or them if they are deported. Some immigrants have had trouble finding legal help. A list of no- or low-cost legal aid providers that was given to them by U.S. officials includes organizations that refuse to offer advice on Mexican soil or have had to overcome serious reservations about doing so. Initial asylum hearings in downtown San Diego are scheduled within 45 days of making a claim, and administration officials hope to put them on a fast track. On the day of their hearing, asylum seekers are told to report to the border crossing for temporary admission to the U.S. and a ride to court. If their cases aren’t completed, they are escorted back to Mexico to continue waiting. In an apparent scheduling glitch, some hearings were moved up to last Thursday, The San Diego-Union Tribune reported. Two of three people scheduled to appear didn’t make it to the border crossing in time.